Please come visit us at our tasting room, located in the heart of downtown Napa. You won’t find any grandiose monuments built by famed architects, or million-dollar hedges at Trahan winery. Our small, family-run winery has been developed by the passion and love for making wine that Chuck and his family share together. 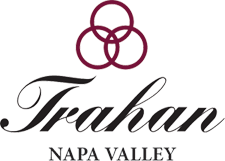 Located in the heart of the Napa Valley, Trahan Winery is a small, family winery dedicated to creating incredible wines from only the highest quality grapes. The vineyards we choose to work with are hand farmed by growers dedicated in their own right to producing exceptional fruit. Our passion is to bring joy into our lives and others through our offering of fine wines.